MOON TOWNSHIP — On a warm spring evening in the North Athletic Complex in Moon Township, the Robert Morris men’s basketball team (18-16) hosted the Cornell Big Red (15-16) in the opening round of the CollegeInsider.com Tournament. Robert Morris came back and defeated the Big Red in overtime by the score of 98-89. However, in the next seven minutes, the Colonials defense only allowed seven points and at the second media timeout, with 11:51 remaining, it was 20-12 Big Red. Jimmy Boeheim and Matt Morgan each had eight points for Cornell. The leader for the Robert Morris was Matty McConnell with six. For every shot the Colonials made, Cornell answered right back; and increased the lead to 11 on a three pointer by Thurston McCarty with Charles Bain right in his face. At the third media timeout, the score was 29-21 in favor of the Big Red. Jimmy Boeheim; son of legendary Syracuse coach Jim Boeheim was leading Cornell with 12 points, while Matty McConnell led Robert Morris with six. With time winding down in the half, Robert Morris and Cornell were exchanging threes, with the lead for Cornell being cut down to three with 2:39 remaining, however, Jimmy Boeheim hit his third three of the game, and already had 21 points. Robert Morris ended the half strong, as Jon Williams nailed a buzzer-beater three from near midcourt to bring the Colonials to within three. At the half, the score was 40-37 in favor of Cornell. Jimmy Boeheim led all teams with 23 points at the half, shooting a staggering 10/12 (83.3%) from the field, including 3/3 from behind the arc. Both Matty McConnell and Josh Williams led the Colonials with nine points in the half, with Williams taking seven shots from deep, making two. As a team, the Colonials were not helping themselves in the turnover battle, with 16 as compared to Cornell’s four. The Big Red shot 57.1% from the field in the first half, as compared to Robert Morris’ 41.2%. To start the second half, Cornell again came out running, with Boeheim scoring his 25th point of the night, only 15 seconds in. The Colonials however, weren’t ready to throw in the towel, as McConnell nailed a corner three with Boeheim’s hand right in his face. With 16:40 left in the game, Boeheim put the Big Red up by 10 after a put-back rebound. With the bucket, the Big Red had hit five of their first six shots to start the half. To make it six of seven, Steve Julian hit a streaking Morgan for the easy layup. With 11:35 remaining in the game, Cornell was up by nine on the Colonials, 62-53. Up to this point, Cornell was outscoring Robert Morris in the half 22-16. Jon Williams hit his third three of the night with 7:13 remaining to bring the Colonials to within one, and the Colonials were on a 14-7 run. Jon Williams continued his timely scoring, on the next possession, with a breakaway layup giving the Colonials their first lead of the game, up 67-66 with 6:53 remaining. Josh Williams again tied the game at 74, as he shot one of two from the stripe. Williams gave the Colonials the lead again, once again on the foul line as he made both his shots after a Jack Gordon foul. Josh Williams nailed his sixth three of the night, and 35th point to put the Colonials up three, 79-76 with 2:06 remaining in the game. Within two minutes, the Colonials were content to take their offensive possessions slow, nursing a one point lead. 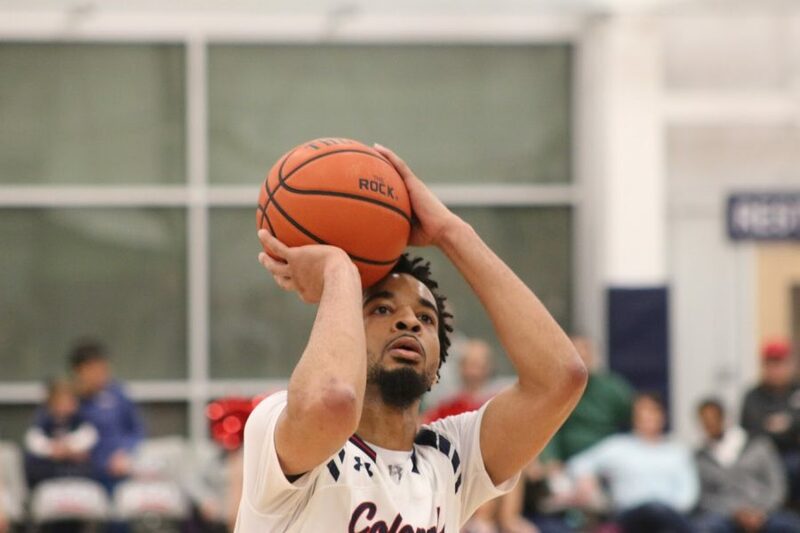 With less than 40 seconds remaining, the Big Red fouled Jon Williams on the inbound pass, however, Williams nailed both free throws to put the Colonials up three, 81-78. Coach Toole called a timeout for the Colonials with 29.1 seconds left, and the Big Red showing full court press on the inbound. Morgan tied the game with 12 seconds left for the Big Red, and with eight second left, coach Toole called a timeout for what could potentially like the final play of the game. At the buzzer, Charles Bain’s potential game winning layup bounced around the rim, but fell out, and the game headed to overtime tied at 82. Josh Williams was leading the Colonials after two with 36 points, while Jimmy Boeheim had 29 for the Big Red. To start the five-minute overtime, Charles Bain won the tip-off, and Jon Williams scored his 17th of the game for the first points overtime. With the Colonials dribbling out the clock, up by 12, the crowd at the North Athletic Complex gave Robert Morris a standing ovation, and the final in this game was 98-89 Colonials. Robert Morris will advance to the second round of the CIT. The senior duo of Josh Williams and Matty McConnell led the team tonight, with Josh Williams leading the Colonials in the game with 36 points, shooting 12-26 from the floor, and 6-16 from behind the arc. Clutch down the stretch was Matty McConnell, as the Pittsburgh native scored 11 of the teams 16 points in overtime to guide the Colonials the win. Jon Williams’s 20 points set his new career high, besting his previous of 14 against Mount St. Mary’s back in November. Williams shot 4/5 from behind the arc, and gave the team their first lead of the game with 6:53 remaining in the second half. In the second round of the CIT, it is not yet known who, where, or when the Colonials will play next.